This is a meme that really fits Joey Lina where he’s called “Squatterman”. 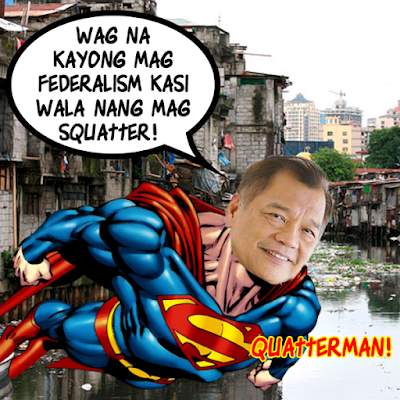 He’s saying here, “Let’s not shift to federalism because there will be no more squatters.” I remembered a couple of times I have written about squatters and one of them was actually how squatters DO NOT contribute to environmental preservation. While I do blame commercialism and reckless industrialization to be a major contributor to environmental destruction but that doesn’t mean squatters don’t share part of the blame. Let’s think about how Yellow politician Congressman Lina or Squatterman would actually survive in a parliament. In a parliamentary, he will have to defend the Lina Law as a senator or member of the parliament. In the parliament — there’s no more Congress. Both the executive and the legislative bodies are merged into one huge Parliament. The Prime Minister, Deputy Prime Minister, respective Ministers of their offices and Senators are all assembled. When there’s the majority bloc then there’s also the minority bloc. Just imagine how Squatterman would have to defend his Lina Squatters’ Law to why it should be defended. He would probably get roasted especially if members of the Senate will bring up the real problem about squatters that was brought thanks to his laws. The Lina Squatters’ Law also shows the defect of the presidential system for this reason — you can see how popularity-based and personality-based politics allow people like Squatterman to sit down in the first place. It doesn’t matter who votes even if they are illiterate squatters. Besides, I remembered writing about three possible reasons why the anti-squatting law got repealed years ago. These reasons I wrote are squatters are easy to bribe for votes, they are good for show business and that they are an easy source of thug power. But under a parliamentary system then we have better chances of eliminating stupid voters — hence it would be the kryptonite to Squatterman’s powers! Just imagine how he will lose support. If uneducated squatters are no longer allowed to vote then no amount of bribery will help him and his friends into their desired seats. Competency-based leadership will certainly depower him and his friends because their strength is only based on popularity-based democracies.